The 2011 census showed 1,707 households and 4,138 people and represented nearly 40% of the population of Rural West York. 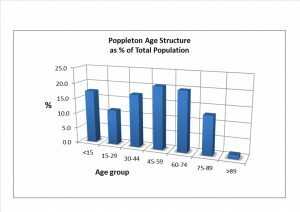 The diagram shows an average age in the villages of 45 years with a high number of retired people, 26% are over 65 years. 17% of households comprise the elderly living alone, many widowed. Many of these people say health issues limit their daily activities (16%), whilst a further 12% of residents spend up to 50 hours or more in unpaid care for needy people. 35% households are exclusively over 65 years old and 17% households contain people over 65 years living alone. Single parent families: There are 57 lone parent households (6%); 36 in Nether and 21 in Upper. Of these parents 17 are unemployed, 19 in full time and 21 in part time employment. All male lone parents are in full time employment, but only 20% of the females. Home ownership: 87% houses are owned and 52% are owned outright. Only 13% of dwellings are rented, with 1% being rent free. Health and provision of unpaid care: Of the 4138 residents the day-to-day activities of 84% were not limited by health issues, whilst 10% were limited a little and 6% limited a lot. 85% said they were in good health, whilst 12% said their health was only fair and 3% poor. 9% provided up to 20 hours of unpaid care per week and 3% more than that. There are more health issues in Upper than Nether Poppleton. Our membership is 121 and 90% of our active Church members live in this area. Not all people’s needs should or will be met through Poppleton Methodist Church. There are two Anglican Churches, Community Centre and Youth Centre and parish rooms. There is evidence of an increasing need for more flexible multi-use space in the community. Poppleton Methodist Church provides spiritual and social support for all age groups, especially for ages up to 11 years and those retired. These represent some of the main areas of need in the community. Existing premises struggle to meet current needs and fall short of meeting the increasing need. Chapel – mostly used for Sunday worship, occasional reflective services, weddings, funerals and a weekly group called Concern (Prayer group) as well as for occasional meetings and concerts. However, its use is limited by the fixed pews and sloping floor. Hall, linked to the church via a small enclosed lobby. Used by a range of church and community groups during the week such as, Luncheon Club, Cameo, dance classes, photographic society, Women’s Institute, Play group, children’s parties and various choirs and charity fundraising events. A regular function that addresses the loneliness issue in the village (ref. 2011 National Census) is “Coffee on the Green” on Tuesday mornings and ‘Tea on the Green’ on Friday afternoons combined with an after school club for 10 year olds and mothers and babies. Three surveys were carried to ascertain what people felt and what they needed in order that we might progress with RUACH. This has ensured that what has been proposed met the necessary immediate and future requirements and needs. The proposals create new multi-use spaces and the altered chapel also becomes multi-use and in that way we achieve a future proofed chapel and community facility. 56% thought we need to improve the heating system. Section 2. What do we need? Chapel has accessibility issues. Access for wheelchairs is through the emergency exit in the adjacent building, down a corridor then through the front of the chapel and up the sloping floor to the extension at the back. Fixed pews limit imaginative use. Hall, kitchen and meeting rooms are not available for use when the Playgroup operates due to necessary safeguarding issues. Storage is inadequate and scattered throughout the premises. Heating system is out of date, very expensive to run and maintain, inflexible in use and far from being eco-friendly. Unused space between church and hall, needs to be covered over. a) Existing Chapel be retained including common area, fixed pews removed and replaced with chairs. Flooring lowered to street level for easy access. New frontage to reflect the original architecture and adjacent hall New entrance with side panels that ‘bring The Green into the Church (see plans). Sliding glass screen separating church from vestibule. Provide a space that can be used seven days a week. b) Enclose the space between the church and hall so creating a hub for information and meeting. c) Hall to be relocated enabling users to use the space uninterrupted thus freeing up the rest of site to be used simultaneously by others. d) Permanent space be made for a ‘coffee shop’ (currently Coffee on the Green) served by a new larger commercial standard kitchen and other essential facilities including uninterrupted from the hub. e) Increase in the number and size of meeting rooms for use by smaller groups. d) Increase the amount of storage space. f) Provide space for small office/photocopying. g) Provide adequate storage for bins and bicycles. h) Provide enclosed soft play area, sensory garden and community seating. i) Increase our eco credentials. Do nothing and ignore current and emerging mission opportunities and needs in community. Demolish and complete rebuild. Membership has made it very clear that they don’t want to rebuild the Church which is fundamentally sound. Refurbish with no additional building – considered not a long term solution. Additional building to existing premises – still leave the major issue i.e. kitchen, café, schoolroom, church and increased maintenance costs. Remodelling of site – the preferred option as it is the only one that delivers the vision in its entirety. We have consulted widely in the community including our membership, adherents and our users through surveys. We have kept everyone informed of the progress of the scheme. We have asked for comments at various stages of the design process. We have listened to church and community groups and made appropriate alterations.